A core concern for international peacebuilders is how to promote cooperation between members of different communities torn apart by conflict. I propose that United Nations peacebuilders, perceived as unbiased enforcers of intergroup cooperation, are particularly well-suited to this task. By contrast, former colonial powers, perceived as biased in favor of certain social groups over others, are far less effective. I test my theory with a comparison of UN and French peacebuilding practices in Mali. Specifically, I offer support for the argument in the form of a lab-in-the-field experiment in which Malians are tasked with extending cooperation to members of the Tuareg minority. Using the findings from this experiment as well as results from a follow-up survey experiment and interviews, I present direct evidence of the mechanisms underlying my theory in favor of a set of other alternatives. The results offer insight into potential best practices for peacebuilding in diverse societies. 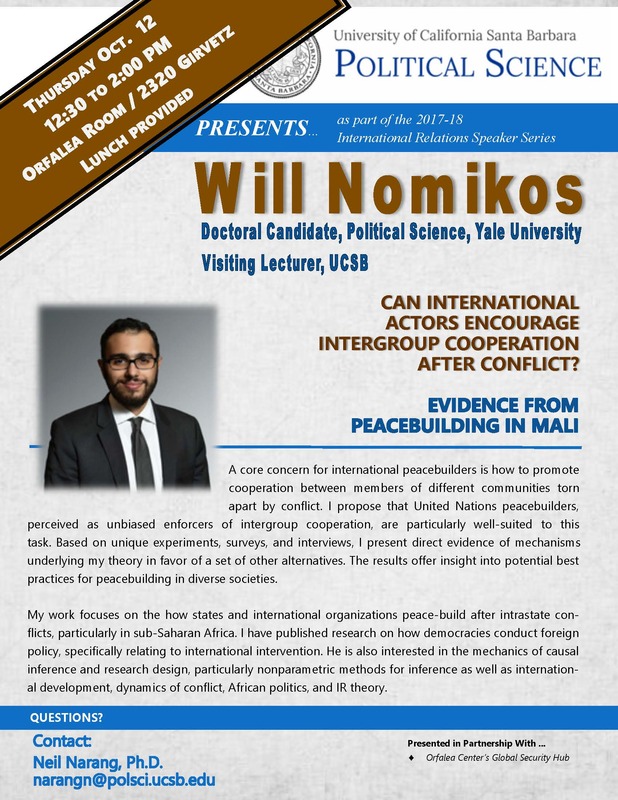 Will is a Doctoral Candidate in Political Science at Yale University, specializing in International Relations, and a Visiting Lecturer in Political Science at UCSB. His work focuses on the how states and international organizations peace-build after intrastate conflicts, particularly in sub-Saharan Africa. He has also published research on how democracies conduct foreign policy, specifically relating to international intervention. He is also interested in the mechanics of causal inference and research design, particularly nonparametric methods for inference as well as international development, dynamics of conflict, African politics, and IR theory.